This recipe was kindly given to me by Ms. Julia, and I recently made it for a little girls night dinner. I am a total sucker for peanut noodles…YUM! I think they’d also be good with a hint of spice, either from red pepper flakes or perhaps the “hot” thai sweet chili sauce instead of the “mild.” Either way, these noodles are delicious hot, cold, and eaten all week long. This makes a ton – about 10 cups (though who actually eats one serving of anything these days). I made mine with whole wheat pasta and natural peanut butter, to make myself feel a little better, and it turned out great. 1/2 cup salted roasted peanuts, chopped. 1. Cool spaghetti according to package, until just cooked. Drain and rinse in cold water. Let it drain very well, and set aside. 2. Bring a small pan of water to a boil, add snow peas and count to 5. Drain immediately and rinse in cold water. Drain well. 3. In a large bowl combine peanut butter, vinegar, sugar, soy sauce, water, sesame oil, chili sauce, garlic and ginger. Whisk together until smooth. 4. 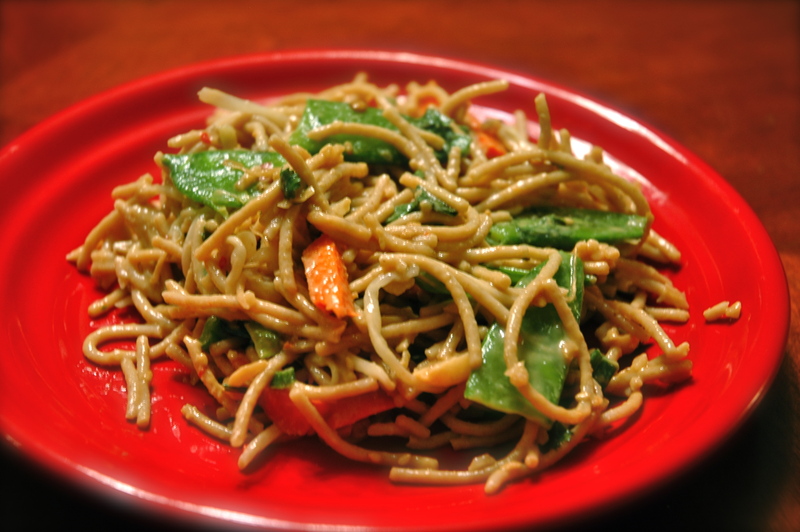 Add cooked pasta, snow peas, sesame seeds, cilantro, carrots, bean sprouts, green onions, and chopped peanuts to dressing. Toss together, coating everything well with the dressing. *Thai sweet chili sauce is a sweet and hot sauce that has a translucent quality about it. I found some in the Asian food section at my local Kroger. Just be warned that this is NOT the very spicy, hot chili paste also carried there. It was so delicious! Thanks for posting the recipe!